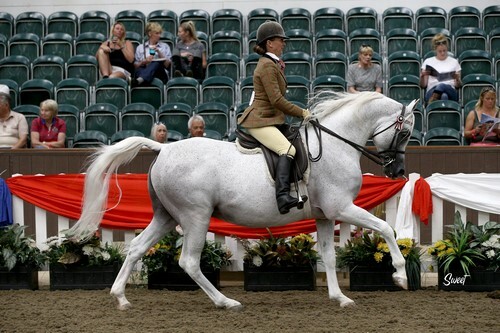 The quality of the ridden classes at this year’s UK International Arabian Horse Show were incredible! I have rarely seen such depth across all classes, and Sunday’s International Ridden Championship was incredible. 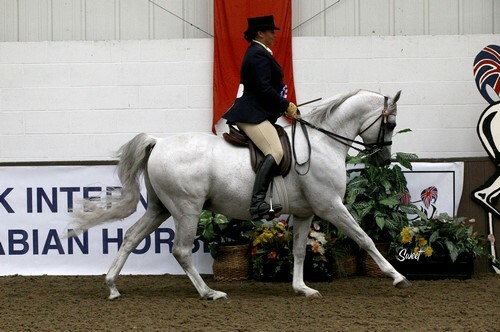 Before we got to these classes, however, there was the last Horse of the Year Show (HOYS) qualifier of the year. These classes were held on the Friday afternoon, and made for a very relaxed beginning to the show. They were judged by John Conifey (ride) and Ann Green (conformation). All classes were sponsored by Simon Constable Equine Vets with Mr and Mrs Roberts. First in were the stallions and taking the win was Ruger AMW (Tallyen el Jamaal x HE Jiajna), bred in Brazil by Flavio Regis Wanderlet and owned by Clare Fitch. Now 20 years of age, it was wonderful to see this charismatic stallion – a multiple champion in-hand as well as under saddle – out in the ring once more. He scored 47 for ride and 40 for conformation, making 87 in total. In second place with 78 points (41/37) was Taymar (Kyro KA x Tamara IV), another import to the UK being bred by Sax Arabians in Germany and owned by Amanda Miller. The HOYS gelding class was very close at the top, with Incandescent (Psalm x Illaria), bred by Diana Whittome and owned by Nicola Winkworth, taking the win with 88 points (46/42). 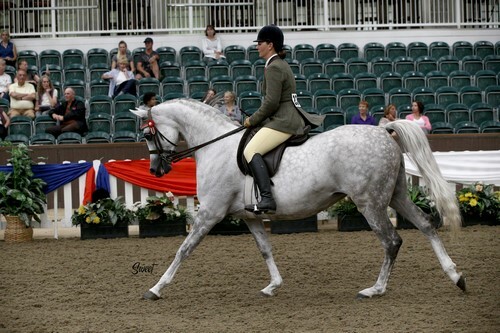 Just a point behind with scores of 41/46, in second was Judal’s Coeur de Lion (WSA Charisma x Judals Sweetest Kiss), bred by Judal Arabians and owned by Claire Doxey; there was actually a tie for second, with Sayyad (Orion OS x Amira Kastanah), bred by Cheryl Richards and owned by K Johnson, also scoring 87 points, but having the lower conformation score (47/40), he had to settle for third. 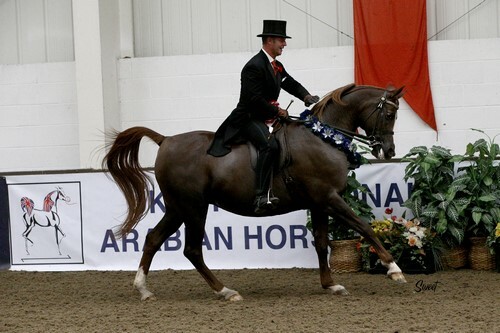 The last of the HOYS classes was the mares, with ES Lelina (Krown x G Lilja), bred and owned by Len Morgan, taking the win with 87 points (45/42); her full sister, CS Lelisha placed third with 80 points (40/40), and you can read more about these beautiful mares in the current edition of The Arabian Breeders’ Magazine. Taking second in this class was the very experienced Eastworth Ahmoshini (Moashiro x Ahmalia), bred and exhibited by Mr and Mrs L S Coombes. She scored 48 for ride, the highest of all the top horses, and 38 for conformation, making 86 points in total. The Championship was a lovely affair, with a very smart group of Arabians forward. They covered a range of ages, and relative novices to seasoned pros, and it made for super watching. The UKIAHS Gold HOYS Championship title – along with the coveted HOYS ticket – went to an overjoyed Stephanie Turner riding Incandescent, with Ruger AMW Silver HOYS Champion. Meanwhile, ES Lelina added another title to her brilliant season as she took Bronze. If anyone watching the HOYS classes on Friday thought that the standard was high, it went up another gear over the weekend. 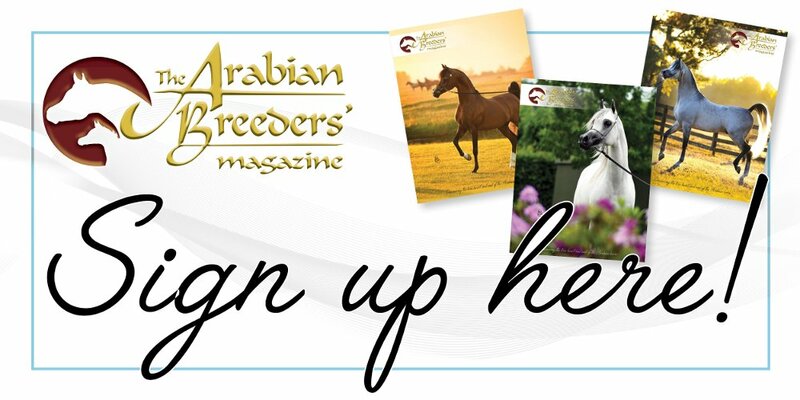 All riders and producers must be commended for showing their horses to such a high standard; the classes were an absolute joy to watch and I was bursting with pride, watching these beautiful Arabian horses go around the arena. The UK ridden Arabian really is the best in the world, closely followed by the Australian ridden Arabian, and I loved watching these classes. 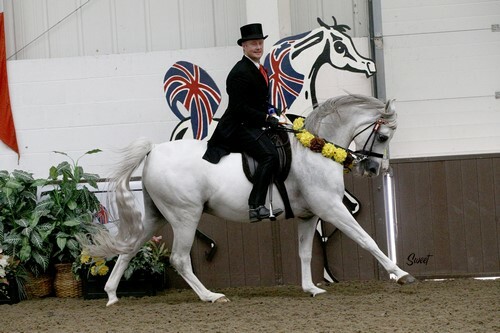 As with UK International tradition, the ridden is broken into two sections, with the preliminary judging taking place on the Saturday morning, and then the presentation of the awards on the Sunday morning. The UK International Ridden Championship then kicks off the afternoon’s proceedings, and the riders look so majestic in their top hat and tails as the very best of the very perform; more of that later. This year’s judges were Joanne White, for type and conformation, and Jane Miller for manners and ride. Ruger AMW continued Friday’s winning ways to come out top in the stallion section, winning with an impressive 90 points – 19.5/18.5/17/35 respectively. In second place was Karen Dewey’s Calimeer (Edeon x Calamintha), bred by the Hon Finn Guinness. This super grey tied for second place on 87.5 points – 17/17.5/18/33 – but the higher ride mark saw him finish ahead of Lady J Hall’s Bey Dayaan (Ganamede x Gold Dayahla), bred by C M Cooke. On to the geldings and taking the top spot was Jo Hollamby’s Fattan (Sire D’Albret x Vermeille), bred by Sheikh Mansoor bin Zayed Al Nahyan. With a huge score of 92 points, Fattan put on a foot-perfect display to earn 16/18/20/38 from the judges. 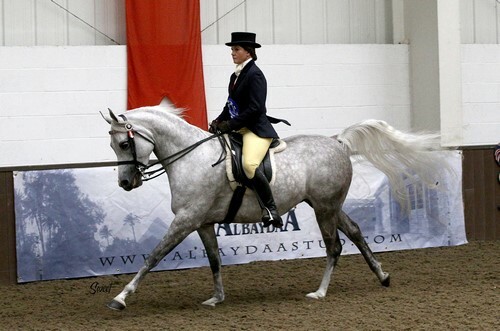 Second place in this class went to the current British National Supreme Ridden Champion, Vartanii (Sisyrinchium x Alsifa Alsara), bred by Mrs P Fogg and owned by Katy Cotgrove. This super grey scored 90 points from the judges; 16.5/17.5/19/37. Third place went to HF Andreas (Rusleem x WFA Andromedia), bred by Sara Warne and owned by Emma-Jane Lineham with 88.5 points; 18/18.5/19/33. The mare class saw the wonderful Shaarinah (Kais x Sherruka Al Roban) take the top spot for her owner, Isobel Grey. 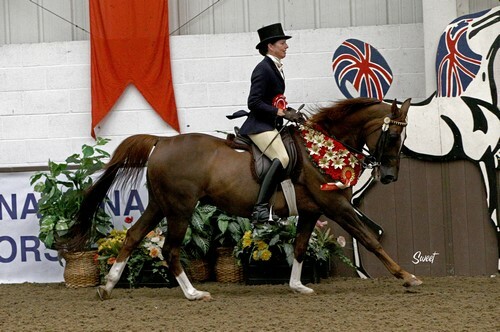 Bred by Silvia Felix, this well put-together chestnut scored 95 points, the highest of all sections, including 20 out of 20 for manners and 39 out of 40 for ride – almost perfect! The rest of her scores were 18/18, placing her well ahead of her competitors. In second place was Signet (Adawy x Om el Shabrina Dream), bred and owned by Judith Powell. This lovely mare scored 19/19/17/33, to finish with 88 points. Just half a point behind on 87.5 points – 19/18.5/16/34 – was Murana’s Nani (Psytadel x Baranka), bred by Murana Stud in Germany and owned by Linda Hughes and Dominic Carden. Sunday’s UK International Ridden Championship truly was a tense affair, and you could have heard a pin drop during the performances. Every horse went forward for their individual display, and every horse tried their level best. However, it was Maria Pook on Fattan who seemed to pull out all the stops, with beautiful dressage moves as well as flying changes and beautiful strides, to take the Gold; I had goosebumps watching. Shaarinah, fresh from her win the night before as the Ridden Arabian Star Series Gold Champion, took Silver, with Vartanii in Bronze. What a championship! It is very hard not to get emotional about the ridden classes; the bond between man and horse is one that has been celebrated for millennia, but when you see a class such as this, it really does humble you, and take your breath away. The Arabian horse is so incredibly willing, and the bond that all these riders had with their horses was truly magical; well done to all. If the Horse of the Year Show Arab classes this week are anything like the display at this show, then spectators are in for a real treat. Good luck to all competitors – I know you will do the breed proud.